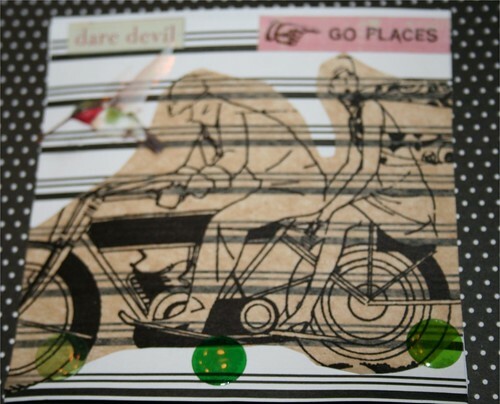 Dare Devil 4" x 4" Collage Card, originally uploaded by DianthusMoon. I’ve been trying to tidy up the house a bit more in anticipation of the upcoming holidays. My bedroom seems to be a ‘catch all’ and I worked two hours in there while Brian cut up more leaves and did raking. 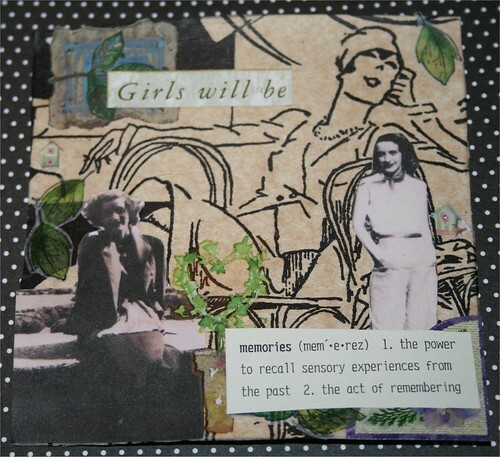 I had been in Tuesday Morning last night and found this vintage look tissue paper and used it on these two cards. Those are shots of my mom in the second one. I was scanning photos for my Christmas card (third year making it) and went to print them out and I need a couple of ink cartridges. I have in my head what I want to do. Should be cute. Brian and I went to Applebee’s-couldn’t do turkey again and had their Lime Chicken. We went to Wally World so I could exchange a gift Sean gave me (for color choice) and saw him scanning like crazy. Did a little shopping while we were there. Cyber Monday is coming up. Will get some things from Sean’s Amazon wishlist and go from there. Applebees–I only go there about once a year. We had the last of the turkey tonight and really enjoyed it. But remember I did not cook the bird until Saturday, so this was only the second night of leftovers. It’s hard to believe tomorrow is the last day of Nov.! Time flies too fast these days. I ran into your blog and I got a good vibe from it. If there sure a thing.